The March assembly will hear from Marshall Krolick. His topic for the evening will be The Common Soldier and the Civil War. Mr. Krolick has been a member of the Civil War Round Table of Chicago since 1961 and served that organization in many capacities. In 1990 he was awarded its Nevins-Freeman Award for distinguished scholarship and dedication to Civil War studies. Marshall has served as a guide for tours of Gettysburg and other Civil War battlefields. His published works include articles in Blue and Gray Magazine, Du Page Magazine, Virginia Country Magazine’s Civil War Quarterly, Civil War Magazine, and Gettysburg Magazine. He wrote the introduction to Morningside Bookshop’s reprint edition of the History of the Eighth Cavalry Regiment, Illinois Volunteers and, for several years, a regular column in Civil War Times Illustrated. At the February meeting Gerridine LaRovere announced that Stephen Seftenberg was seriously ill. This issue of Haversacks and Saddlebags was written by Robert Schuldenfrei. Bob will continue to write this newsletter with distribution help from club members. We all wish Steve a speedy recovery and hope that he will be back at the editor’s desk in the near future. We opened the discussion with Bob laying out the ground rules. This event would go nowhere if the moderator just gave a lecture. He quipped that he is not a Civil War expert; he just plays one at the Civil War Round Table. Everyone would have to jump into the discussion after a brief, very brief, introduction to the topic. First out of the blocks was Sherman’s Meridian Campaign. The Meridian Campaign was the desire of Sherman to keep his troops doing productive work during the winter. He wanted to head for Mississippi and the tempting targets of manufacturing facilities in Selma, AL. Problems for him were Polk, Johnston, and Forrest. He would bring Smith down from the north while he led troops east out of Vicksburg. He travelled light (celerity) with only food, ammo, and medical stores. No luxuries! It was an exercise of living off the land. They travelled so fast that Polk could not mount any resistance. In 11 days they were in Meridian. Polk did manage to remove 12,000,000 dollars of military property, but Sherman had the land which he promptly savaged. Sherman blamed Smith for not reaching Meridian. Smith was busy destroying railroad along the way. This caused Smith to move at half the pace called for in the plan. Smith employed “out-riders” later to be called “Bummers.” Forrest got word of Smith and his plan to tear up rails all the way to Meridian. The threat of Forrest caused Smith to turn around. Note the Forrest story about the trooper fleeing the fight. The battle at West Point Forrest pinned down the rear-guard with most of his force and sent a regiment around the flank to encircle Smith’s troops. After resting his forces Forrest pursued Smith. Smith, once again, set up a rear-guard with a few regiments hoping to escape with the main body. Again, Forrest chewed up the small group that formed a piecemeal defense. Twice more the attack was pressed. Presently Forrest called it off as his men were exhausted. Forrest’s green troops gained valuable confidence that they could whip a force twice their size. Smith’s troops were demoralized. Of course Sherman was a huge success. “I scared the bishop (Polk) out of his senses. This was true. Sherman’s star was rising and the fear of “Sherman’s torch” was spreading in the deep south. On February 9, 1864 Lincoln sat for his photograph in the Washington studio of Mathew Brady. One of the images taken that day was used in the 1914 issue of the five dollar bill. It was issued to commemorate the dedication of the Lincoln Memorial. Note that this image was not used in later series $5.00 bills. On February 1, 1864 a bill to promote Grant to the rank of Lieutenant General passed the House by a vote of 117 – 19. It would be on February 26, 1864 that the Senate would take similar action. Washington was the last officer to hold that rank although Winfield Scott held the brevet rank. There was some politics involved in the promotion of Grant. Elihu Washburne was a friend and promoter of both Grant and Lincoln. He claimed that Grant’s name was being used as a “football” for those wanting to run for the presidency in 1864. As a quid pro quo Lincoln supported Grant’s promotion and Grant supported the reelection of Lincoln. Habeas corpus, Latin for "you [shall] have the body," is the name of a legal action or writ by means of which detainees can seek relief from unlawful imprisonment. The Suspension Clause of the United States Constitution specifically included the English common law procedure in Article One, Section 9, clause 2, which demands that "The privilege of the writ of habeas corpus shall not be suspended, unless when in cases of rebellion or invasion the public safety may require it." In the Confederacy, Jefferson Davis suspended habeas corpus and imposed martial law on February 17, 1864. This was in part to maintain order and spur industrial growth in the South to compensate for the economic loss inflicted by its secession. Davis had to fight Vice President Alexander Stephens who was a constant thorn in his side. Stephens could not see the practical side of nationhood when it ran up against states’ rights. On February 17, 1864 Hunley (not CSS Hunley) made the world’s first successful attack against an enemy warship. 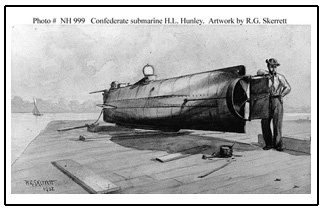 This was not the first semi-submersible designed and built by Horace Lawson Hunley. Two earlier boats, Pioneer and American Diver were tests crafts. Both were lost; the former scuttled when Union troops advanced on New Orleans. The later sunk in a storm in Mobile Bay. Hunley sank USS Housatonic, a steam-powered sloop of war at the entrance to Charleston harbor. While successful, the Hunley did not survive the encounter. Even after the raising of the sub in August of 2000 it is not clear why the Hunley sank. It was not flooded as the crew had not set the pump to remove water from the crew compartment. Lack of oxygen killed the crew. Each crewman was at his station slumped over the propulsion mechanism. Blockade runners who sold to the public dealt almost exclusively in luxury and other high-profit items, despite the ever-present need for staple goods. The practice was so egregious that the Confederate congress came to ban the import of luxury items, though the law was not effectively enforced. The states that entered the Confederate States accounted for 70 percent of total US exports, and the Confederate leaders believed that this would give the new nation a firm financial basis. The South produced enough food to feed itself, but distribution and exports placed a heavy burden on them. By February of 1864 things got so desperate that blockade runners were exporting food and tobacco. The Confederate Congress claimed ½ of the food and tobacco on outbound ships. On February 6, 1864 the Confederates tried once again to ban US currency. They exempted US postage stamps. However, it was common knowledge what the “exchange rate” was between Northern and Southern money. The ban did not extend to US dollar backed securities, so was ineffective at controlling large financial transactions. Currency represents a small amount of the wealth of nations. On February 6, 1864 Meade advanced on Lee at Morton’s Ford on the Rapidan. He wanted to test the Southern battle-hardened veterans of Gettysburg. Like so many battles, the Northern forces took to the offense and met with early success. The first division of this force, under Brig. Gen. Alexander Hays crossed the Rapidan and engaged the Confederates who were huddled in their camps trying to stay warm. Those same troops, rallied under the command of George Steuart, fell upon the Hays Division and drove it back across the Rapidan with considerable losses. This battle was to be a diversion to the opening of a raid on Richmond conceived by Gen. Ben Butler that had fired the imagination of politicians in Washington.